Babak Yaghoobi has released an updated version of his DPF Android native components with support for Delphi XE6 Firemonkey. If you haven’t heard of the DPF Android component suite before it is a set of wrappers for the native Android components like WebView (which is the same way the default TWebBrowser component works). There are over thirty different demos included showing how to use the various components. Some of the notable components included in the suite and new to this release are TDPFJHTTP (with Authentication, http, https, upload file), TDPFJAnimation, and TDPFJTextView. There are also three new useful functions which are GetIPAddress, isInternetActive, getMACAddress. Some of the other components include TDPFJTabHost, TDPFJImageView, TDPFJListView, and TDPFJScrollView. You can mix these native component wrappers with normal Firemonkey controls in your Android apps (for an IOS version click here). I assume the DPF Android component suite still works in Delphi XE5 and AppMethod. It does come with a custom classes.dex file which you will need to merge with the default classes.dex file to get full functionality from some of the components. DPF Android is free and you can download it from Sourceforge. If you find it useful Babak is accepting donations. 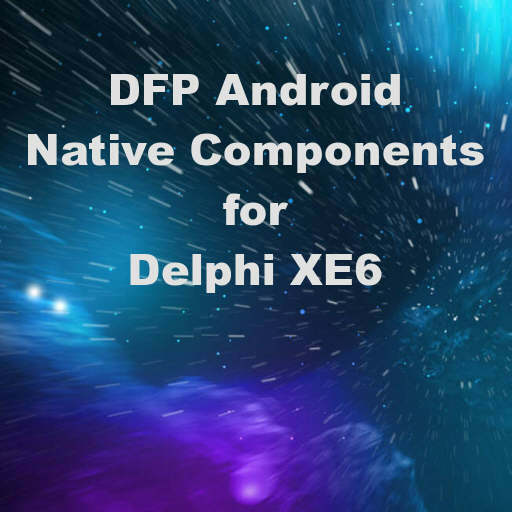 Head over and download the free DPF Android native component wrapper suite for Delphi XE6 Firemonkey. Thumbs up, your work is highly appreciated. DPF Android Native Component Suite For Delphi XE8 Firemonkey On Android is released?